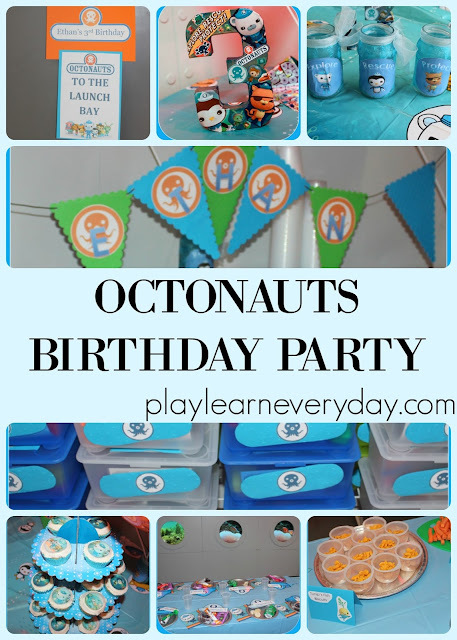 This year, after going over a few different options, we decided to go with an Octonauts theme for Ethan's third birthday party. He has a few of the books and loves to watch the show, and after seeing the submarine party room at a local indoor playground we knew that it was the perfect choice. We went to a large soft play centre, with areas for different age ranges of children and a great imaginative play area. Ethan loves it there, and all of his friends had a great time climbing and sliding for our hour and a half of play time. The only down side was that it is a massive place, so we had to share it with a lot of other children (on a rainy Saturday) and all of the three year olds were excitedly running around everywhere. I did make special stickers for them to wear so that it would be easy to identify other party guests, but they really were all over the place! They all had a lot of fun though, and the submarine party room with its portholes and big metal door were too cool for me to pass up. As the venue has just recently been redone, and the rooms are incredibly themed, I wasn't allowed to hang anything up on the walls and possibly damage the paint. This was a bit of a challenge for me, but it definitely wasn't going to stop me from doing a bit of decorating! We had helium balloons in bunches just suspended on ribbons as well as balloons on sticks. The balloons on sticks were in three different jars that were on the cake table. I used 3 jam jars and covered them in blue tissue paper with PVA glue (sticking them on and then painting the glue over the tissue as well to make it solid and shiny). I then made pictures 3 of the main Octonauts characters (Barnacles, Kwazii and Peso) and the Octonauts motto 'Explore, Rescue, Protect' and stuck those on the jars as well to make themed vases to hold the balloons. I made paper bunting, which I strung from the balloon sticks along the cake table. 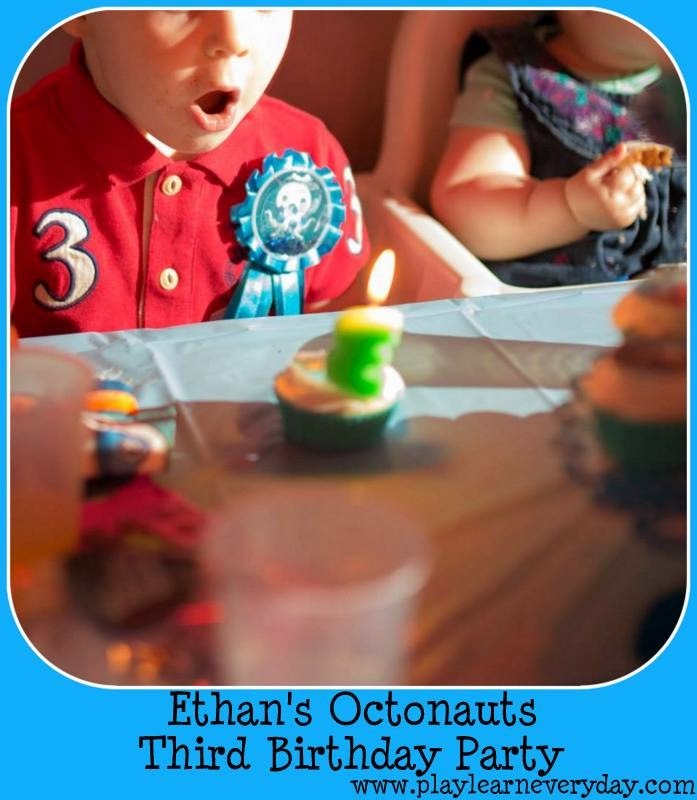 The bunting was embossed with a bubble design (more details about that in my Cuttlebug post) and I made cut outs of the Octonauts symbol with the letters to spell out Ethan's name on them. 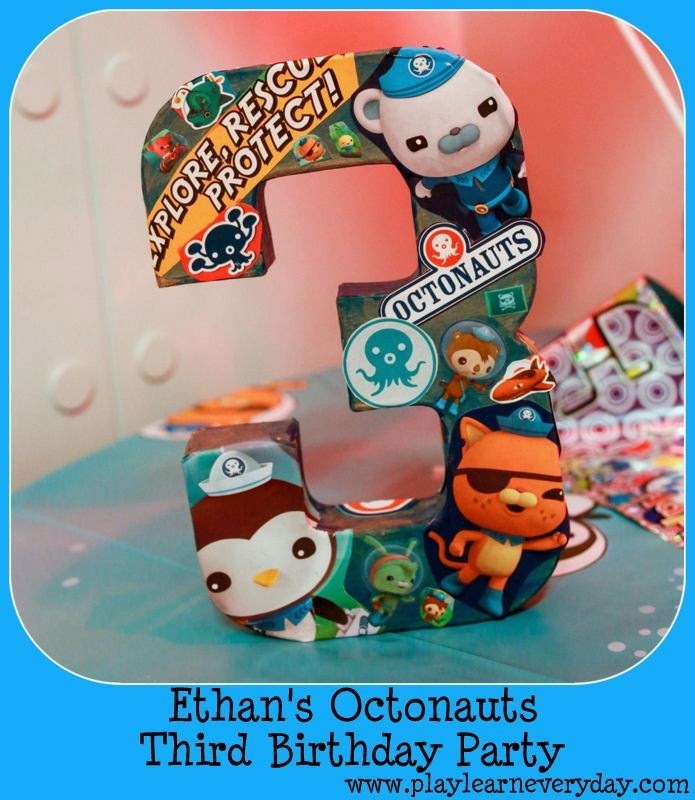 The last thing that I made is this cardboard number 3 that I got from Hobbycraft and then decorated with Octonauts pictures cut out from Ethan's magazines and stuck on with PVA glue (in the same way that I did with the jars). Another reason that we chose this venue is because they provided the food, and I knew that this year that just wasn't something that I wanted to take on. There was a selection of sandwiches and hot food for the children to choose from, as well as a few snacks that were on their plates to start with. Because we also had quite a few of Ethan's friends' younger siblings at the party, I put some more baby friendly snacks (smoothie pouches and rice cakes) on their plates. I did want to include some themed food though, and there were a few characters that I left out of the party bags (see below) so we had to have some of Tunip's 'fish biscuits' and some of Tweak's 'buncha munchy crunchy carrots'. For the fish biscuits I used Goldfish Crackers (Finz in the UK) in little fish bowls (yogurt pots that look like fish bowls that we'd been collecting). The carrots were displayed on a fish shaped cutting board that I found at Tiger and just couldn't resist buying. We had cupcakes instead of a cake, as I find it much easier at parties that we don't have to cut a cake. I made simple vanilla cupcakes with white icing, then bought some Octonauts cupcake toppers (designs on rice paper) that I just placed on the top of each cake. Then I displayed the cupcakes on a three tier cake tray, and put a number 3 candle in Ethan's cake. The first favour that the children were given were the party hats on the table. I attached name tags to each one as place cards (this was mostly because there were different snacks for toddlers and babies and it avoided any confusion). I absolutely loved these little Octonauts hats that I bought (although you could easily make your own but cutting out the basic shape and sticking on the symbol). And I was so impressed that both Ethan and Ivy wore theirs the whole time. The party bags / boxes became a very special project of mine. I used the Glis boxes from Ikea, as I like to think that the boxes themselves can be useful after the party and not just thrown away. To decorate them I wanted them to look like Peso's medical kit. I printed out the Octonauts symbol with each child's name on it to stick on the top, then made the symbol that is on Peso's kit to go on the side. I used blue card, cut into a bandage shape, then embossed with dots and stuck on a blue Octonauts symbol in the middle. Inside the box I had printed out a list of the contents, and I had included one vital item from each of the characters from the show. The box itself was Peso's, then we had a little Octonauts notebook and some coloured pencils as Barnacles' Captain's Log (I would have put in his compass, but to be honest I couldn't find any), Kwazii's pirate eye patch, Shellington's magnifying glass, Dashi's camera and a lollipop that I covered in tissue and wrapped pipe cleaners around to look like Inkling Octopus. I also put some fish stickers and a jumping frog just as a few extras. I did separate boxes for the younger siblings, as many of the toys weren't suitable for babies. Those boxes contained 2 bath toys, bubbles and should have had a fish finger puppet (but they didn't arrive in time). Ethan had such a wonderful time, and it was great to see him having so much fun with his friends, most of whom he's known for his whole life. 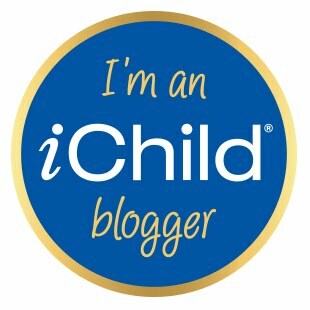 It's great to see them all growing up together and sharing these milestones in their lives. 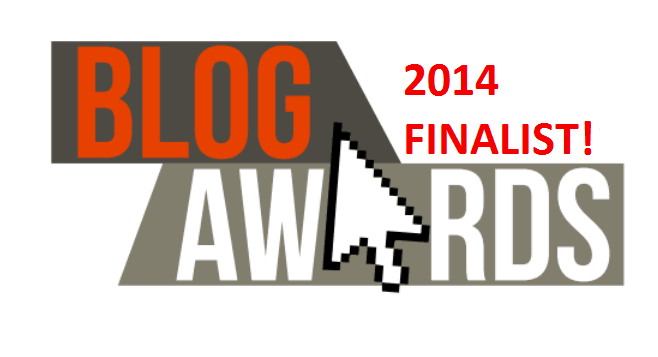 Now to start planning for next year!